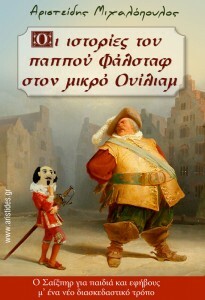 Greek version is available now! 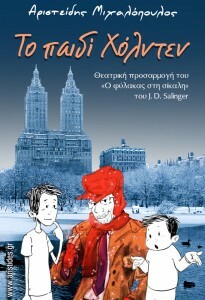 One night, two brothers, one young and the other still younger, gain a new cousin by their mother’s sister. The day their cousin is born, their mother has to go to the maternity hospital and their father to work. The children? They aren’t old enough to stay at home by themselves yet, who would look after them? There is no-one available. They can’t go to the maternity hospital. Perhaps their dad can take them with him to work? Yes, fortunately. Their father works, or so he says at least, at nights. His job is to tell lies, together with a friend of his and two other curious types who are waiting for someone. And, as if they weren’t even a tiny bit ashamed, the whole world listens to their lies. But it’s not their fault. The blame lies with another man, a storyteller named Samuel Beckett, who wrote all these lies in a book and dad has read them so many times that he knows them inside out and he and the other three talk about them in a deserted place. But how have so many people gathered to listen to them in that deserted place? What sort of job is this, really? The younger boy, although not due to a lack of trying, cannot understand why his dad has to go to the theatre every night to play with his friends and not stay at home and play with him… The older brother tries to explain to him that acting is a job like all the others. 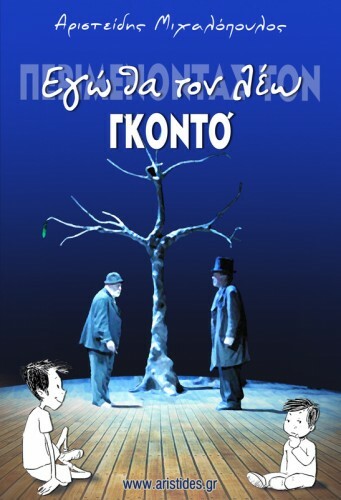 But because the play is for adults and it wouldn‘t be right for them to sit with the rest of the audience, the children anxiously watch Waiting for Godot from the wings, and it is as if they too are performing. They listen to the peculiar dialogues, which often remind them of the way children think and speak, they watch the unexpected reactions of the protagonists to incidents unknown to them, and try to explain, in their own way, the things that not even the adults have managed to interpret. All together they wait for Mr Godot, who is desperately late in coming to play with them. Luckily, the man who owns the theatre says they can have a break so the children can eat something and meet with the director of the play. But the director knows how to keep secrets, and doesn’t tell them what’s going to happen next. In the second part of the play nothing new happens. It is as if they are watching the same play from the beginning. Except that it is tomorrow now… The children pretend that they too are playing. But the rotten Godot is nowhere to been seen. The younger boy begins to get annoyed, and the older one becomes impatient. And then, when the former has not yet managed to fret too much, and the latter has not become openly impatient… the play ends! No joke. When no-one is expecting it, the play ends. As if it were possible! And Godot? He sent a boy to tell the actors that he would come tomorrow. When tomorrow? Be the first to review “I will call him Godot” Click here to cancel reply. Aristides Michalopoulos © 2019. All Rights Reserved.